If you have always wanted to learn about the greatest book on Earth, this app makes it easy for you, even if you are not religious. In the privacy of your home you can explore the message and meaning of this great book on your own. Free Bible App. Videos. Daily Readings. A New Bible Version that is more accurate to the original Greek text in words everyone knows and understands. Articles. Search Tool. Easy for Everyone. 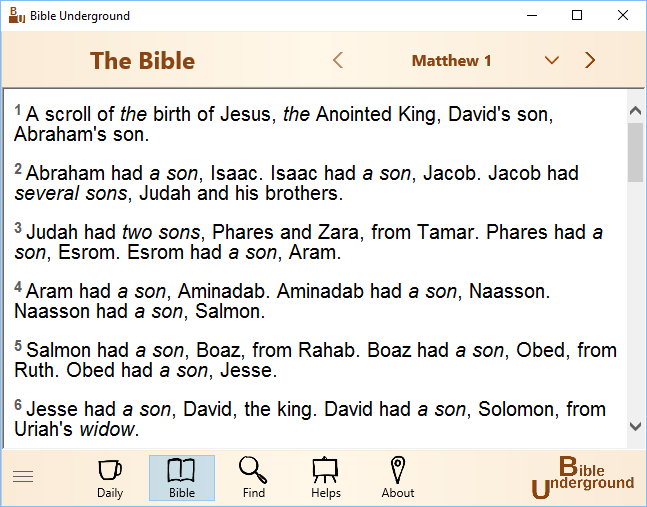 The author of this app is a Bible translator and Bible scholar who has observed how traditional Bible teaching actually hides the true meaning of the Bible and makes it harder to understand, all the while giving the student a false sense of knowledge. This app corrects that and reveals the many solutions to life that God's Message has. Bible Underground can be freely distributed over the internet in an unchanged form. Title: Bible Underground Author: Ray Geide Version: 1.4.0.0 Website: breakthroughversion.com Email: ray@breakthroughversion.com ______________________________________________________ END-USER LICENSE AGREEMENT FOR THIS SOFTWARE Important - read carefully: This End-User License Agreement ("EULA") is a legal agreement between you (either an individual or a single entity) and the mentioned author of this Software for the software product identified above, which includes computer software and may include associated media, printed materials, and "online" or electronic documentation ("SOFTWARE PRODUCT").